Many of Europe’s medieval cathedrals are museums in their own right, housing fantastic examples of craftsmanship and works of art. Additionally, the buildings themselves are impressive. 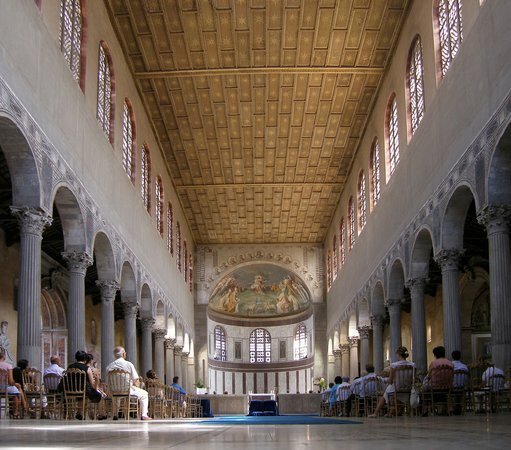 Although architectural styles varied from place to place, building to building, there are some basic features that were fairly universal in monumental churches built in the Middle Ages, and the prototype for that type of building was the Roman basilica. In ancient Rome, the basilica was created as a place for tribunals and other types of business. The building was rectangular in shape, with the long, central portion of the hall made up of the nave. Here the interior reached its fullest height. 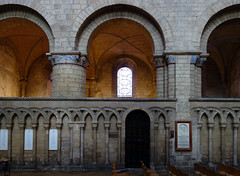 The nave was flanked on either side by a colonnade (a row of columns) that delineated the side aisles, which were of a lower height than the nave. 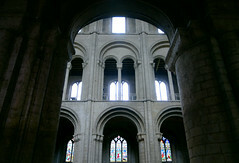 Because these side aisles were lower, the roof over this section was below the roofline of the nave, allowing for windows near the ceiling of the nave. This band of windows was called the clerestory. 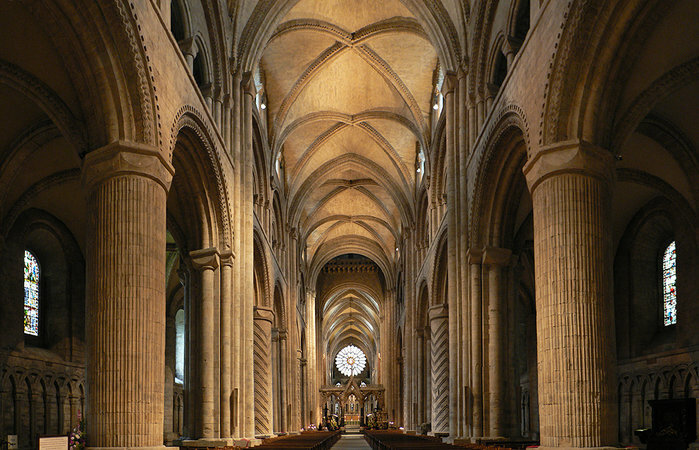 At the far end of the nave, away from the main door, was a semi-circular extension, usually with a half-dome roof. 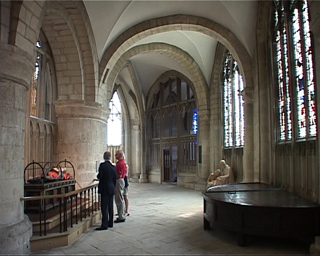 This area was the apse, and is where the magistrate or other senior officials would hold court. 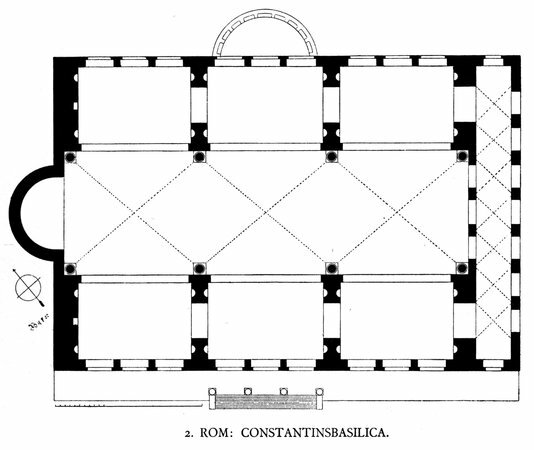 Because this plan allowed for many people to circulate within a large, and awesome, space, the general plan became an obvious choice for early Christian buildings. The religious rituals, masses, and pilgrimages that became commonplace by the Middle Ages were very different from today’s services, and to understand the architecture it is necessary to understand how the buildings were used and the components that made up these massive edifices. 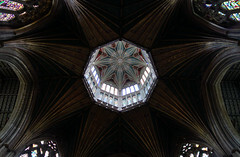 Although medieval churches are usually oriented with the altar on the east end, they all vary slightly. When a new church was to be built, the patron saint was selected and the altar location laid out. On the saint’s day, a line would be surveyed from the position of the rising sun through the altar site and extending in a westerly direction. This was the orientation of the new building. 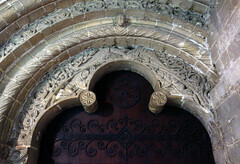 The entrance foyer at the west end is called the narthex, but this is not found in all medieval churches. Daily access may be through a door on the north or south side. The largest, central, western door may have been reserved for ceremonial purposes. Inside, you should imagine the interior space without the chairs or pews that we are used to seeing today. 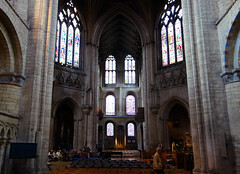 In very extensive buildings there may be two side aisles, with the ceiling of the outer one lower than the one next to the nave. This hierarchy of size and proportion extended to the major units of the plan—the bays. The vault is the arched roof or ceiling, or a section of it. 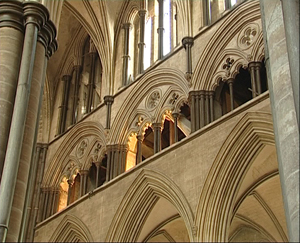 Salisbury Cathedral, top of the nave arcade, above that the gallery, and above that, the windows of the clerestory. 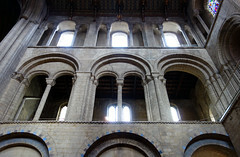 The major arcade (row of arches) at the ground floor level is topped by a second arcade, called the gallery, which is topped by the clerestory (the windows). 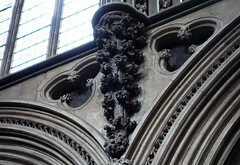 In later Gothic churches, we sometimes see yet another level below the clerestory, called the triforium. The nave was used for the procession of the clergy to the altar. The main altar was basically in the position of the apse in the ancient Roman basilica, although in some designs it is further forward. The area around the altar—the choir or chancel—was reserved for the clergy or monks, who performed services throughout the day. The cathedrals and former monastery churches are much larger than needed for the local population. They expected and received numerous pilgrims who came to various shrines and altars within the church where they might pray to a supposed piece of the true cross, or a bone of a martyr, or the tomb of a king. The pilgrims entered the church and found their way to the chapel or altar of their desire—therefore, the side aisles made an efficient path for pilgrims to come and go without disrupting the daily services. Development of this plan over time shows that very soon the apse was elongated, adding more room to the choir. 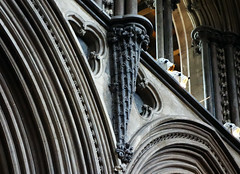 Additionally, the ends of the aisles developed into small wings themselves, known as transepts. These were also extended, providing room for more tombs, more shrines, and more pilgrims. 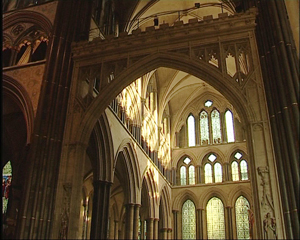 The area where the axes of the nave and transepts meet is called, logically, the crossing. An aisle often surrounds the apse, running behind the altar. 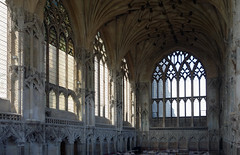 Called the ambulatory, this aisle accessed additional small chapels, called radiating chapels or chevets. 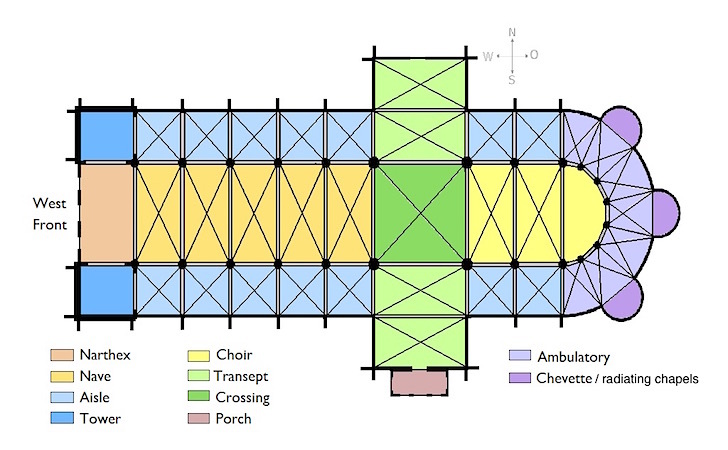 Of course, there are many variations on these typical building blocks of medieval church design. 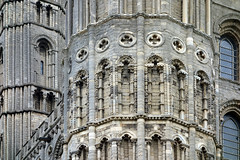 Different regions had different tastes, greater or lesser financial power, more or less experienced architects and masons, which created the diversity of medieval buildings still standing today. Cite this page as: Valerie Spanswick, "Medieval churches: sources and forms," in Smarthistory, August 8, 2015, accessed April 20, 2019, https://smarthistory.org/medieval-churches-sources-and-forms/.